Stacking firewood on pallets is a great way to store your firewood off the ground, allowing it to properly season. Why should you elevate your firewood instead of just stacking it directly on the ground? Firewood that rests on the ground will soak up ground moisture, preventing the wood from drying out and potentially causing mold growth. Firewood that is elevated eliminates ground moisture and it allows air to flow around all sides of the wood, allowing it to properly dry. Plus, elevated firewood reduces the amount of insects and rodents that live within your firewood stack. Mice, spiders and various insects love to create a home in firewood that rests on the ground. By simply elevating the wood, you can reduce the amount of unwanted pests living within your firewood, and more importantly it will be dry when you're ready to use it. Although there are a lot ways to elevate your firewood off the ground, pallets are one of the cheapest and easiest ways to do it. Plus, if you sell firewood it's an easy way to measure the wood, ensuring your customers are getting what they pay for. When stacking firewood on pallets the first thing you'll need to do is find some cheap pallets. Pallets are everywhere and many people will be happy to give them away if you just ask. I was able to get several from a building project we did at my home. A lot of builders simply burn them or throw them out, so if you just ask around they're usually happy to give them away. 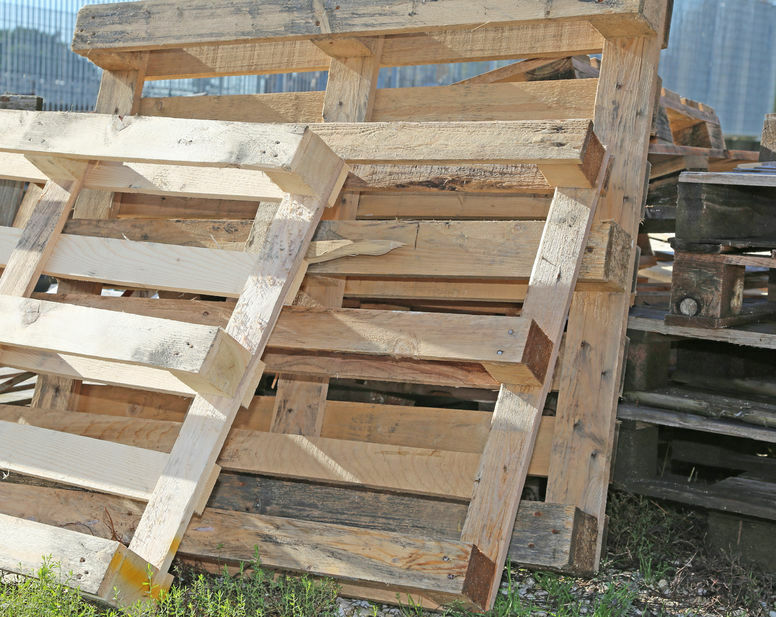 Another option to find pallets is online. Typically, Craigslist will have some for sale for around $2-$3 each. Since a typical pallet will last about 5 years or more, a couple of dollars is a small price to pay for the convenience of the pallets. Next, buy a few 6 foot metal T-Posts from your local home improvement store. The 6 foot posts work better than the 5 1/2 foot T-Posts and they only cost a few cents more. By using the 6 foot posts, you can drive the post into the ground past the foot plate and still have enough post sticking out of the ground for a 4 foot high firewood stack. When driving the posts into the ground you can use the backside of your splitting maul or a sledge hammer. Or, if you wold like to spend about $20 you can purchase a post driver which works really well. I like to drive the posts into the ground at a slight inward angle to the firewood stack. Since the weight of the firewood will eventually push the T-Posts outward, it reduces this possibly and helps keep your firewood stack straight. When setting up your pallets, make sure they're resting on level ground which will prevent your firewood from falling over. You can line up as many pallets as you want in a row, making your firewood stack any length. The height however should not exceed 4 feet, since the stack will become unstable if it's any higher, potentially falling over. In this particular stack, the rows are 8 feet long and 4 feet tall. This firewood was cut to 16 inch lengths and later sold to a local customer. 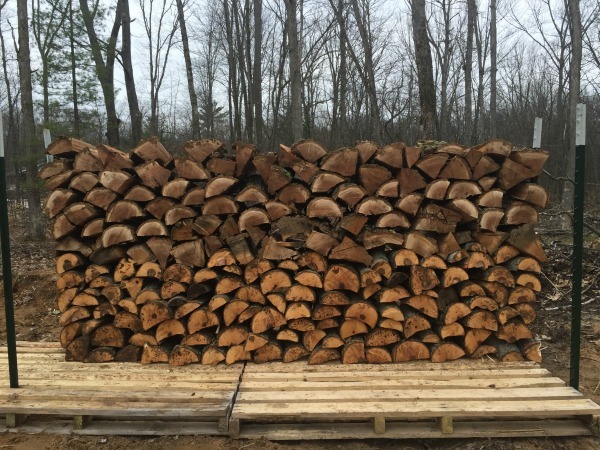 By stacking it neatly on the pallets and between the T-Posts, firewood customers know exactly how much wood they are getting, it looks nice and it's professional. You'll also notice I've stacked the firewood with the bark side up. Although there's a lot of debate whether or not this matters, I think the bark side on the top helps shed any moisture off the stack and doesn't allow water to pool on top of the firewood. Typically, I like to stack 2 individual rows on each pallet. You can stack 3 rows with the middle row being the highest which works really well. Then, cover the top portion of the stack with a piece of plastic or a tarp. The higher middle row allows any water to run off the stack, creating an angled roof over your firewood. Overall, stacking firewood on pallets is a cheap, easy and organized way to stack your firewood while ensuring it receives proper airflow. 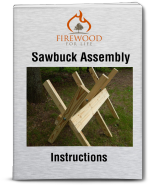 With just a few pallets and a couple of metal T-Posts, you can quickly create a nice firewood stack for the upcoming winter.